Small colleges serving an underserved population can sometime struggle to get noticed. If you are the kind of student who has had to face serious obstacles in high school, if your education has been disrupted for any reason, if you’re the first in your family to even think about college, if you are a recent immigrant with big aspirations but few options, it can be extremely difficult to navigate the college admissions landscape. In this viewbook, we wanted to speak to the persistence, courage and ambition of SVC’s prospective students and give them clear examples of how an SVC education can support their aspirations. 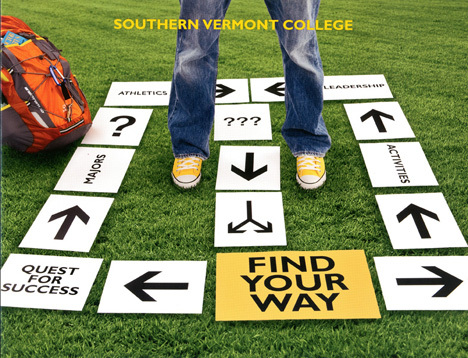 We wanted to help them move past their sense of of college as a “sink or swim” experience and let them know SVC understood their needs and had the programs, people and commitment to help them achieve their goals. The tagline/theme for the book, the design and the copy, work together to reinforce the promise this college makes to its unique market.